> Fire, a tool broadly used for cooking, constructing, hunting and even communicating, was arguably one of the earliest discoveries in human history. But when, how and why it came to be used is hotly debated among scientists. A new scenario crafted by anthropologists proposes that human ancestors became dependent on fire as a result of Africa's increasingly fire-prone environment 2-3 million years ago. A new scenario crafted by University of Utah anthropologists proposes that human ancestors became dependent on fire as a result of Africa's increasingly fire-prone environment 2-3 million years ago. 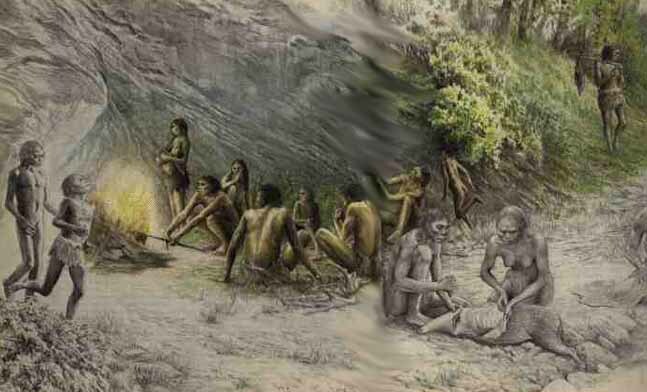 As the environment became drier and natural fires occurred more frequently, ancestral humans took advantage of these fires to more efficiently search for and handle food. With increased resources and energy, these ancestors were able to travel farther distances and expand to other continents. A newly discovered hearth full of ash and charred bone in a cave in modern-day Israel hints that early humans sat around fires as early as 300,000 years ago - before Homo sapiens arose in Africa. In and around the hearth, archaeologists say they also found bits of stone tools that were likely used for butchering and cutting animals. The finds could shed light on a turning point in the development of culture "in which humans first began to regularly use fire both for cooking meat and as a focal point - a sort of campfire - for social gatherings. Researchers from Israel say that mysterious clay and stone artifacts from Neolithic times could be the earliest known "matches". Although the cylindrical objects have been known about for some time, they had previously been interpreted as "cultic" phallic symbols. The researchers' new interpretation means these could be the earliest evidence of how fires were ignited. Innovation not climate change may have triggered early humans' migration out of Africa, a new study suggests. For early Homo sapiens, periods of population movement coincided with social advances and tool-making innovation, the work found. By contrast, human movements didn't match as closely with changes in Africa's climate, such as rainfall variation or other weather issues, as previous research had suggested. The study authors caution, however, that their work doesn't suggest a specific cause-and-effect relationship. Scientists have discovered evidence for the earliest known wildfire in Earth's history, the journal Geology reports. It comes in the form of small plant fossils preserved as charcoal, which were unearthed by researchers near the town of Ludlow on the Welsh borders. The plant remains date to the Silurian Period, about 443 to 417 million years ago, say a Cardiff University team. Previously, charcoal was known only from the later Devonian Period, which saw an explosion in plant diversity. But in the Silurian, plants were generally quite small, which would have restricted the fuel source for wildfires. Human-like species living in Africa up to 1.5 million years ago may have known how to control fire, scientists say. US and South African experts analyzed burnt bones from Swartkrans, just north of Johannesburg, using the technique of electron spin resonance. It showed the bones had been heated to high temperatures usually only achieved in hearths, possibly making it the first evidence of fire use by humans.